Number of electrons present in the bonding orbitals is represented by Nb and the number of electrons present in antibonding orbitals by Na. 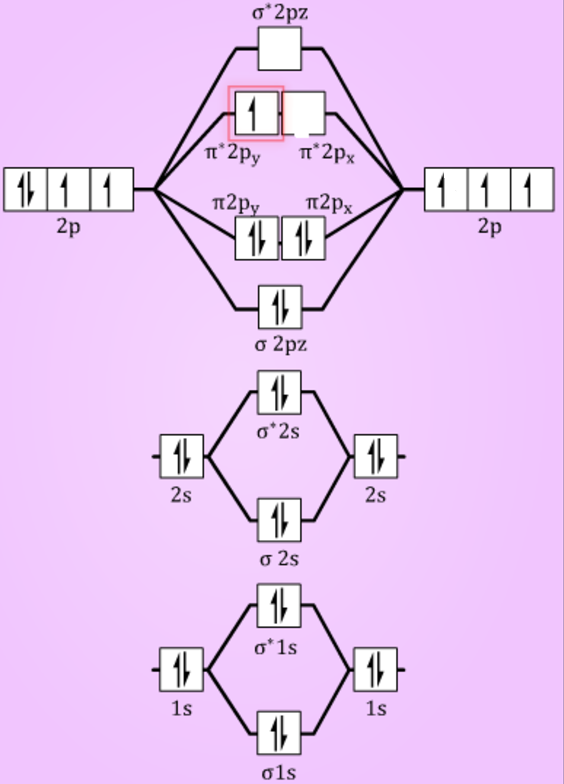 1) If Nb > Na ,the molecule is stable because greater number of bonding orbitals are occupied than antibonding orbital, resulting in a net force of attraction. 2) If Nb < Na , the molecule is unstable because the antibonding influence is greater than the bonding influence, resulting in net force of repulsion. 3) If Nb = Na ,the molecule is again unstable because influence of electrons in the antibonding molecular orbital is greater than the bond influence of electron in the bonding molecular orbitals. Bond order is defined as half of the difference between the number of electrons present in the bonding and antibonding orbitals. The molecule is stable if Nb > Na ie. bond order is positive. The molecule is unstable if Nb < Na i.e. the bond order is negative or zero. For diatomic molecules ,the stability is directly proportional to the bond order. A molecule with the bond order of 3 is more stable than a molecule with bond order of 2 and so on. Bond order 1 ,2 and 3 mean single ,double and triple bond. Bond length is found to be inversely proportional to the bond order. 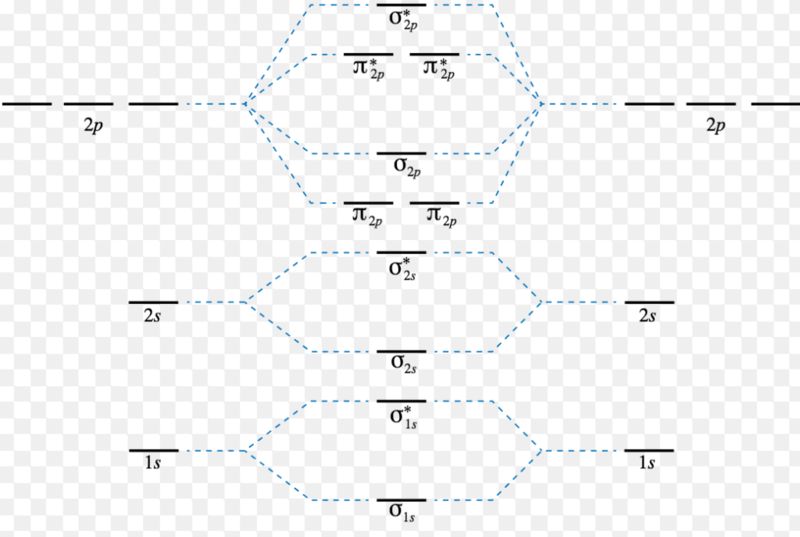 Greater the bond order, shorter is the bond length. If all the electrons in the molecule are paired, it is diamagnetic in nature. If the molecules has some unpaired electrons ,it is paramagnetic in nature. Greater the number of unpaired electrons present in the molecular or ion, greater is its paramagnetic nature. 2) Positive bond order means it is stable. 3) One unpaired electron is present.Hence it is paramagnetic. Positive value of bond order indicates that H2 molecule is stable. Bond order value of 1 means that two hydrogen atoms are connected by a single bond. Greater value of bond order for H2 molecule than H2+ ion shows that two H2 molecule is more stable than H2+. Bond length of H2 is smaller than that of H2+ ion. As no unpaired electron is present, the H2 molecule should be diamagnetic. 2) Smaller positive value of bond order indicates that it is somewhat stable. 3) Since it has one unpaired ,it is paramagnetic. No bond is formed between two helium therefore He2 does not exist. As the K closed shells do not take part in bonding, they are called non-bonding orbitals. 2)Li2 is a stable molecule. 3)It has no unpaired electron ,it should be diamagnetic. The double bond in C2 consist of both Pi bonds because the four electrons are present in the two pi molecular orbitals. Bond order value of 3 means that N2 contains a triple bond. High value of bond order implies that it should have highest bond dissociation energy. Presence of no unpaired electron indicates it to be diamagnetic. It has one unpaired electron , therefore it is paramagnetic in nature. It has two unpaired electron , therefore it is paramagnetic in nature. The bond order of 2 justifies the presence of double bond in O2 molecule. The presence of 2 unpaired electrons makes the molecule paramagnetic. The presence of unpaired electron makes the molecule paramagnetic. The presence of no unpaired electron makes the molecule diamagnetic. I want to a note for this. Chapter.plz send me tha note. Diagram for O2+ is wrong because 2p atomic orbital of 2nd O atom will have only 3 e-. Thanks for the correction and letting us know, we have made the changes, keep reading this website.